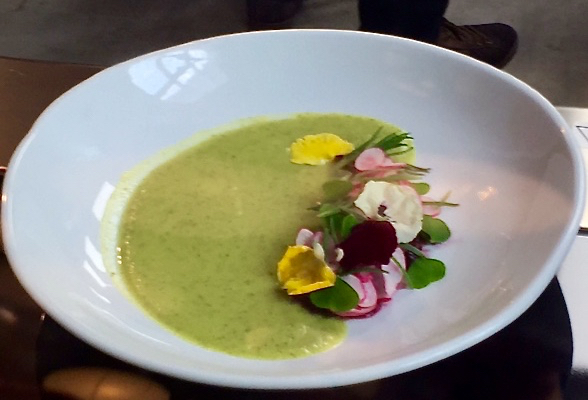 From inspiring restaurant meals to inspiring chefs! 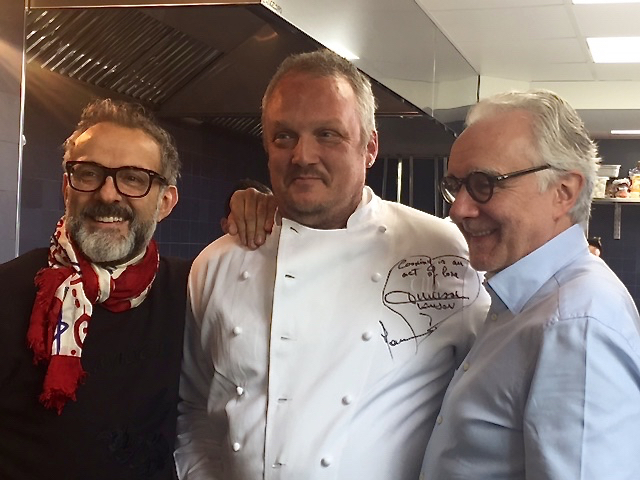 Simon & I are delighted to welcome our first ever guest blogger – my good friend Amanda who recently met and worked with two of the World’s greatest Chefs – Massimo Bottura & Alain Ducasse. Massimo is an Italian restaurateur and the chef patron of Osteria Francescana, a three-Michelin-star restaurant based in Modena, Italy which has been listed in the top 5 at The World’s 50 Best Restaurant Awards since 2010, & currently number 2 in 2017. Massimo has been an advocate of social justice ever since he was involved with supporting the Parmesan makers following the terrible earthquake in May 2012 in the Emilia- Romana region & his home town of Modena, Italy that damaged thousands of wheels of the famous cheese. 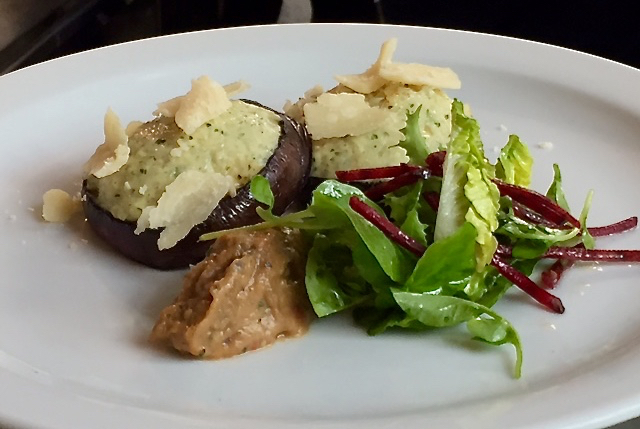 He devised a ‘Risotto cacao e pepe’ – ‘cheese & pepper’, based on the traditional Roman pasta dish utilising the Parmigiano Reggiano that was damaged. This inspired Massimo to create ‘Food for Soul’, a non profit organisation that fights against food waste in support of social inclusion & well-being. The first project launched in Milan during the Expo of 2015, with follow up projects in Modena & Bologna in Italy and in Rio di Janeiro, Brazil during the Olympics of 2016. ‘Bringing dignity back to the table’ is what Massimo aims to do with Refettorio Felix, a project that opened on 5 June 2017 as part of London Food Month. 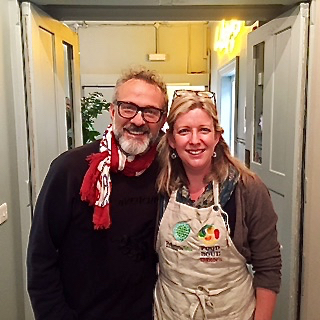 Each day for 6 weeks he invited celebrity chefs in to cook a 3 course meal for the group of homeless and disadvantaged Londoners who regularly visit St Cuthbert’s, a drop-in centre in Earls Court, West London. I went to volunteer on Day 2, acting as a ‘welcomer’ and waitress, and was totally inspired by the whole experience! I knew Massimo had been cooking on the opening day, but didn’t know who was in charge of the (quite small) kitchen on Day 2. 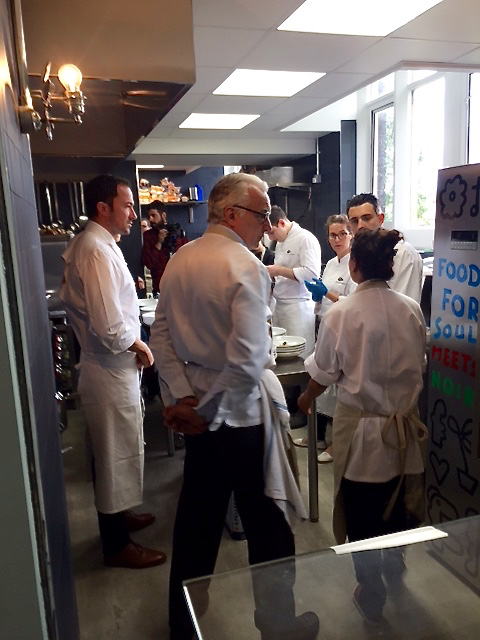 It turned out that Alain Ducasse was there with his team of chefs cooking that day, leaving Massimo free to host. This was definitely the dream team with 6 Michelin stars between them. The food was stunning, the atmosphere warm and welcoming and the diners were very appreciative. Admittedly some would have liked more potatoes and bigger portions, but others literally licked their plates clean! It was a delight to see them enjoying the food so much, a privilege to serve them and chat to them as they ate. So what was on the menu that day? 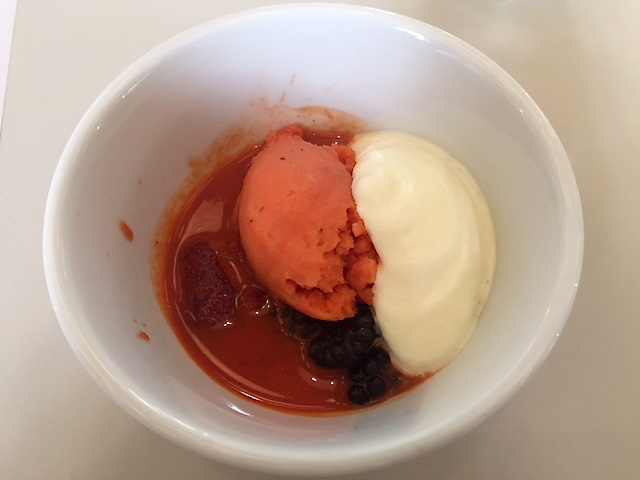 The starter was courgette soup with a garnish of diced cherries, chives and edible flowers, followed by aubergine slices stuffed with chicken with seasonal Mediterranean vegetables, and the grand finale was a stunning vibrant pink orange watermelon sorbet garnished with a red pepper and strawberry sauce and whipped cream. The food was plated beautifully and the flavours were fresh, summery and sophisticated. We “staff” were served the same meal once the diners had gone and it was absolutely divine! Massimo aims to promote a sense of community, whilst tackling issues of food waste and poverty. Most of the food used was provided by the Felix Project- a charity that collects surplus food from retailers, wholesalers and restaurants in London and delivers it free of charge to projects like this. They are providing the kitchens with produce including fruit, vegetables, cereals, dairy, herbs and drinks on a daily basis. The kitchens demonstrated how surplus food can be transformed into something beautiful to look at and nutritious to eat. What a great collaboration….and what’s even better is that it is designed to last beyond the initial 6 weeks and so permanently go some way to “bringing dignity back to the table”. To date over 16,000 meals have been served with 210 guest chefs, 600 volunteers and 25 tons of food surplus utilised creating delicious, nutritious meals across the 4 projects internationally, with 2 tons of recovered food, 6500 dishes served, 300 volunteers and 30 guest chefs involved in London. I hope to re-visit later in the 6 weeks, and then after the launch period is over to help again and to add my little bit of support to what is a ground-breaking project and one that is making a lot of people very happy.